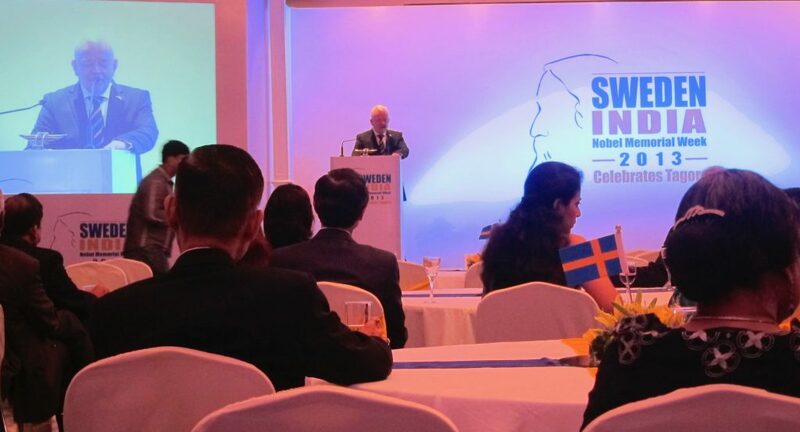 For the seventh year, the Embassy of Sweden in New Delhi along with a number of Swedish businesses and companies, again organise a Sweden-India Nobel Memorial Week in several major Indian cities – Mumbai, Pune, Bengaluru, Chennai, Hyderabad, Ahmedabad, Kolkata and New Delhi. The annual high-profile event showcases innovations and creativity of Sweden and Swedish companies with an aim to further enhance the image and interest for Sweden in India. The Week always comprises a number of events ranging from seminars and panel discussions among well-known decision makers from government and businesses as well as researchers and academicians; to competitions for students, cultural performances, exhibits, etc. 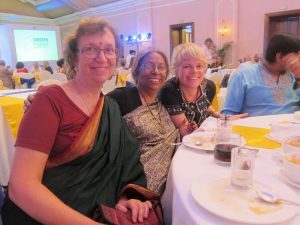 In Hyderabad, Bangalore and Chennai, Sweden Education Days are organised. Several Swedish universities, including Lund University, participate in these events. 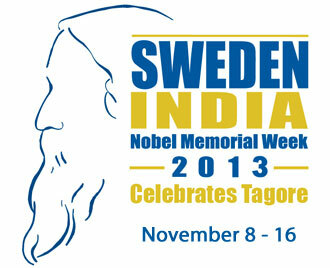 The Sweden-India Nobel Memorial Week 2013 has had a special focus, namely to celebrate the 100th anniversary of Rabindranath Tagore being awarded the Nobel Prize in Literature. 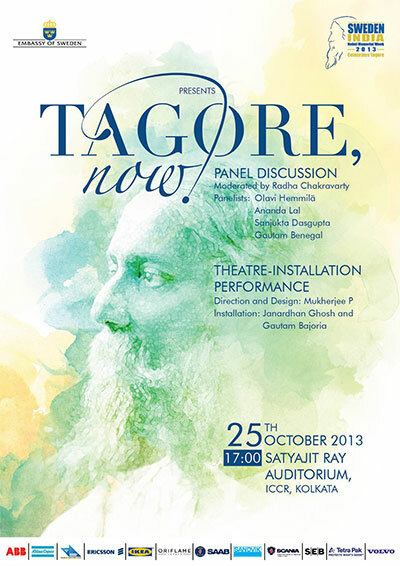 Tagore was the first non-European ever to win the Prize, and the Embassy’s celebrations began in his home town of Kolkata already on 25–26 October 2013, and then continued in Delhi on 8th November onwards. Tack Telegraph för att ni nämner indiska kören, som var det bästa inslaget i jubileumsfirandet, dessvärre uteslutet ur det officiella svenska programmet. Obegripligt. 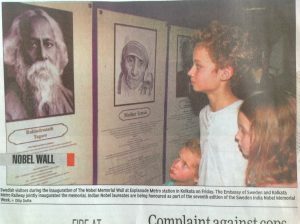 The Kolkata programme on 25 October began with the Ambassador of Sweden to India H E Mr Harald Sandberg, inaugurating the Nobel Memorial Wall (which commemorates the Indian Nobel Laureates) in the presence of General Manager of Metro Railways Kolkata, Mr Radhe Shyam at the Esplanade Metro Station. The wall will be a permanent structure at the busiest station in Kolkata. Another two temporary walls will be fabricated at Gitanjali (his Nobel Prize-winning work) and Shyam Bazaar (closest to his home in Jorasanko) metro stations for a week. In addition, there will be track side branding at Rabindra Sarobar. The highpoint is of the Kolkata programme was Tagore, now! 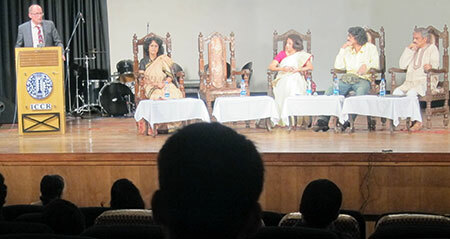 A panel discussion (photo), moderated by Tagore expert Dr Radha Chakravarty which aims to explore the relevance of the timeless poet, writer, philosopher in today’s day and age. Panelists included filmmaker Gautam Benegal, Swedish Tagore scholar Dr Olavi Hemmilä, University of Dalarna, and Indian academics Prof. Sanjukta Das, University of Calcutta, and Prof. Anand Lal, Jadavpur University. This was followed by a theatre-installation ensemble by noted theatre person Parnab Mukherjee, who has created a special performance around Tagore’s Nobel acceptance speech especially for this occassion. Pia, Bubu, Lena and Annwesh. 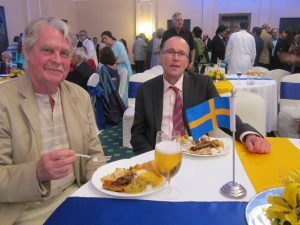 Ambassador Harald Sandberg then invited to a grand reception at Oberoi Grand Hotel, a gathering of the rich and powerful people of Kolkata. The following day, Tobias Degsell (photo), a curator and educationist from the Nobel Museum, conducted Spark of Creativity workshops for young business professional and taught them how to be more creative, come up with new ideas and how to become better problem solvers. There was also a Photo Exhibition ‘Sweden through Indian Eyes’. Impressions of Sweden are captured Kolkata-boy Abhijit Chakrabarty, winner of last year’s photo competition: Swedish Innovations-Indian interpretations. Earlier in September, the Nobel Memorial Quiz was organised in Kolkata where a large number of college students vied for the regional title. The winning team from IIT Kharagpur will compete for the National title and an all-expenses paid trip to Sweden in New Delhi on November 16. Among other programmes nationwide, one that stands out has been the unveiling of a sand sculpture of Rabindranath Tagore by artist Sudarshan Pattnaik. This public event took place in the coastal city of Puri in Odisha state on 12th November. 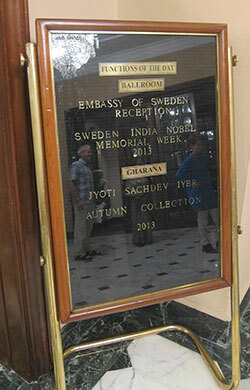 See the full programme for the Sweden-India Nobel Memorial Week 2013.